When your brother is an orangutan, you have a serious responsibility. John Solomon’s father brought Raja home from a business trip to Indonesia when the boy was 10. Now John’s 16, and the orangutan is fully grown, potentially dangerous. Still, he deserves something better than his current life in a tiny cage. 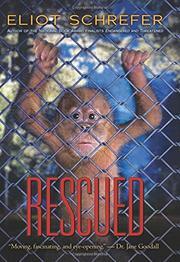 For his third book about great apes, Schrefer tackles the issue of animals in captivity, setting much of his story in the United States. The first-person narrative opens violently, when, after two years as the boy’s brother and near-constant companion, the orang accidentally bites off John’s finger. John understands; Raja was frightened. There’s a flashback to the ape’s arrival, but most of the action happens six years later, after John’s parents’ divorce. His father tries to place Raja in a sketchy “petting zoo” in West Virginia. Raja escapes, John rescues him, and the two begin an aimless journey. No one in this country wants a full-grown male orangutan. Happily, they encounter a veterinarian who, through a series of coincidences, helps John take Raja back to a protected area in Sumatra. Much of the adventure requires strenuous suspension of disbelief for an adult reader, but young teens will enjoy John’s success. Any other solution would be heartbreaking for readers as well as the boy and his beloved brother.